If you have taken a look at the top 200 grossing games on iPad you will see that Casino games are usually well represented. When I checked just now there were five games in there. 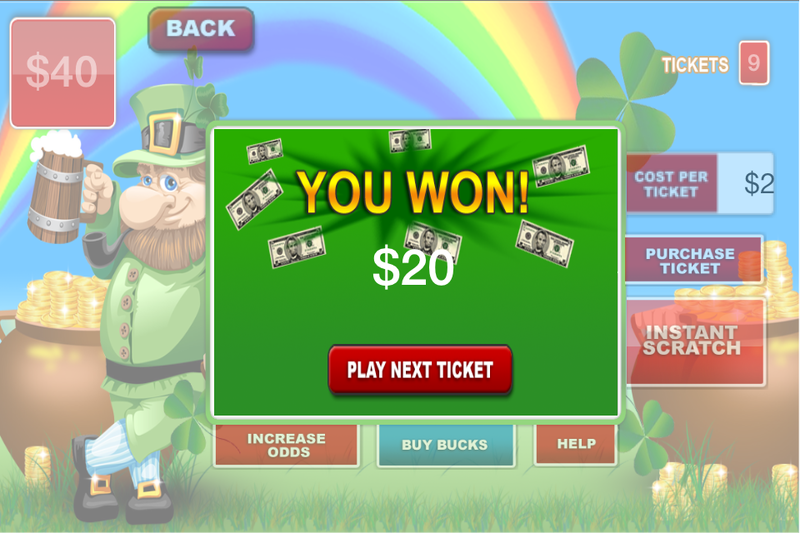 Casino, “virtual betting”, and “lotto” type games are hot and will continue to be hot. In fact this has proven itself to be one of the fastest growing areas in games on the App store, with a high ROI for reskinners. 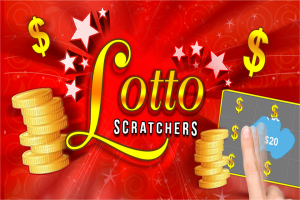 Lotto Scratchers was designed specifically to capitalize on the trend. 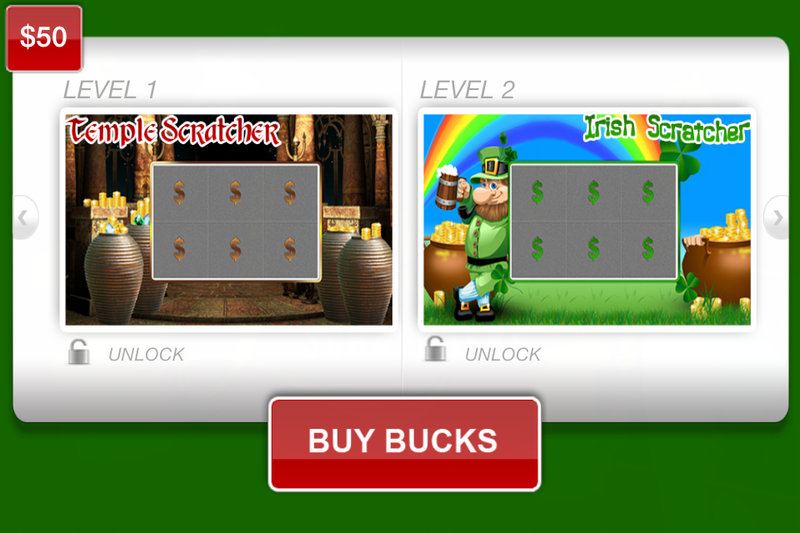 In the first month that Brian put the game up, it grossed just over $1000 (advertising and in app purchases). Pretty sweet. One of the mistakes you might make looking at this game is to dismiss it because of the relatively “bland” graphics. Yes they are not some 3D graphic adventure to compare with Diablo III or GTA 5, but the graphics firstly work perfectly for this type of game and secondly, you can reskin them anyway. This is an important point I’d like to make about games in the app store that you reskin. You don’t have to necessarily enjoy them, so long as the demographic you are targeting does. 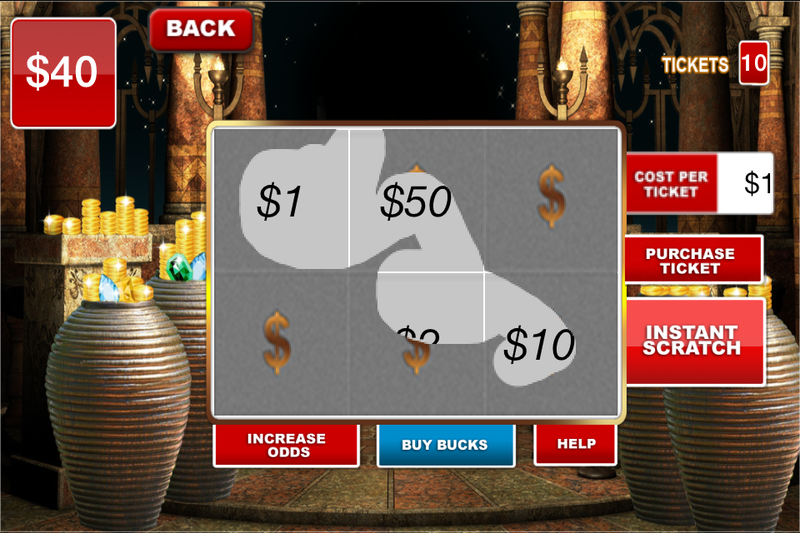 And the design of this game is such that people who are into “Casino” style games they are going to love this. Make sure you take the time to look at this source code carefully, I think its definitely one you should consider adding to your stable. Here is the link to play it right now on the app store. A universal app that works on both iPhone and iPad. 5 Different Themes (2 unlocked, 3 locked). Developed in Objective C and uses storyboards (not that you need to worry about this). Currency System (great to keep players interacting and spending). Documentation on what changes need to be made and where (great to pass on to your favorite geek). Image Asset list for easy handoff to a graphic designer (the artists love this). This makes it more fun for the player, literally helping them “scratch their itch” (sorry). There is a number of stage rooms (for want of a better term) and you can easily add more if you are that way inclined, or you can just use the ones in place already. Really the game has many areas to entice the player to spend and increase your bottom line, and thats not including the ads. But this is not at the expense of fun, because there is a good balance throughout. 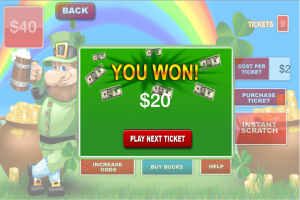 If you (or your players) love “scratching tickets” to win, you will love playing this. Because of the nature of the game, there is a lot less to reskin, so you are going to be able to save money on the reskin which also means that you get it into the app store quicker. But remember, it still has a ton of monetization built in, so its a complete win/win for you! Yes, the games does, here are two examples of what they look at. Remember Ad’s in free games are a good thing. 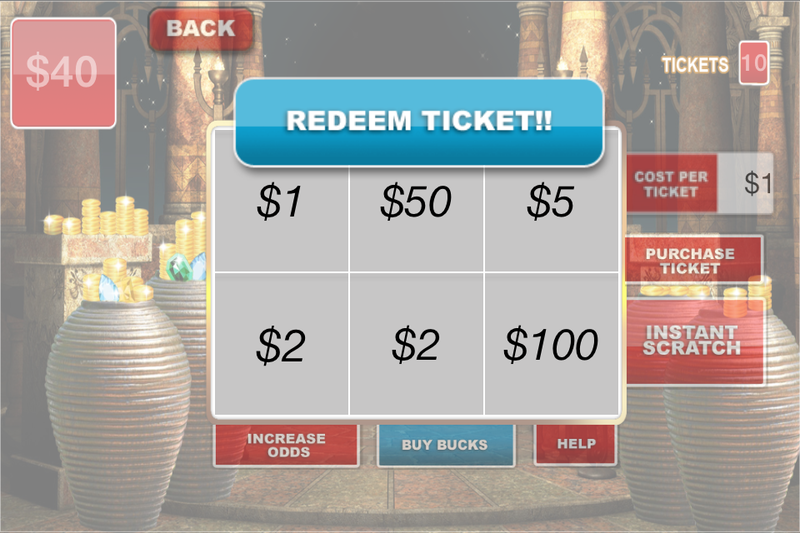 The player gets the game for free, and you get to make some money. Everyone is happy! Like much of the source code you can pick up, they often allow you to buy a single license, or an unlimited license. Just so we are all clear on definitions, the single license allows you to create one reskin only, and is a good option if you feel you will never want to reskin it again. The unlimited license, unsurprisingly, gives you the option to do unlimited reskins. Keep in mind that the unlimited license can be a good way to reduce the overall cost of each reskin, because you spread the one unlimited license cost across more than one game. It’s also important to realise that you can target completely different demographics with each reskin, meaning you are increasing the total downloads by individual players. For example you could have a Barbie Campervan theme and a “Back to the future” hoverboard theme, and its likely that most players of one theme would not have downloaded the other one. The point I am trying to make is, multiple reskins are a great way to maximise your return on investment and build up a larger number of downloads, and saving money with the reduced cost per reskin. So there you go. Brian has made both the single and unlimited licenses available (you decide what best meets your needs). I am in the middle of reskinning this game and will have a demo of it available on this page for you to see for yourself. But I want to go one step further. How about a discount if you get us to reskin Lotto Scratchers for you? 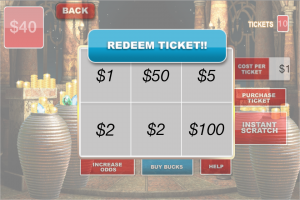 Thats right, if you buy Lotto Scratchers right off this page (either version) by clicking either of the links below, and then get us to reskin one or more copies of the game for you, I am going to pass on a ten (10%) discount of the price you pay for the source code, right off the top of your reskin costs. While it won’t pay your mortgage off, it’s better for that cash to be in your pocket, right? Our costs are already extremely competitive, especially when you compare the unique services we can provide with app store optimization, and amazing graphics which you will not find elsewhere. Obviously I cannot extend this indefinitely, so if you are interested in this, please get in contact with me quickly. This genuinely is only going to be made available for a limited time. Feel free to “keep me honest” by asking for a quote up front, when I say genuine discount I mean it! This gives you the license to reskin the source code a single time. To get started just click the Buy button. Remember we can help with reskins if you wish, and be sure to take advantage of the discount I mentioned above. Please also note the terms and conditions further down the page relating to the purchase of this license. Sorry, I No Longer Have This Available/Recommended Any More. This is the unlimited license, allowing you to reskin it any number of times. To get started just click the Buy button. Remember we can help with reskins if you wish, and be sure to take advantage of the discount I mentioned above. Please also note the terms and conditions further down the page relating to the purchase of this license. For those of you who want to take part in Reskin frenzys! Brian has put together a package of this game, and two others. Now you can go crazy and reskin three games, an unlimited number of times. And at a discounted price. The “boring” but important legal stuff you need to read AKA Terms and Conditions. Avalanche Mountain Apps and Brian Appell (the creators of this source code) have a list of requirements for this game, that you agree to when purchasing. * All graphics must be changed (pretty basic, a reskin is a new face, can’t do that without changing the graphics). * The name of the app must be changed (a no brainer, and part of the reskin process). * All music and sounds must be changed (again a no brainer). * You may NOT resell the source code (note that I have Brian’s express permission to offer this source on this page, and when you do purchase you are getting the “official” version of this code, and all support from Brian). 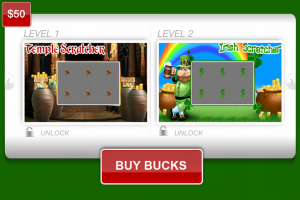 * If you purchase one license, you can only create one reskin. Additional reskins require additional licenses. I suggest you go for the unlimited license so this is not an issue. * You may NOT license this source code for the sole purpose of reskinning and reselling the app (basically the idea here is to reskin it and upload to the app store and make money from the various monetization). * If at some point you decide to sell your app then you must specify you are transferring the license and that the buyer does NOT own the source code. In other words, the buyers gets the samee deal you did. * When you purchase an “Unlimited License” you can create as many reskins with that source code under your own developer account. You however may not transfer that multiple license to someone else, or share that multiple license with someone else unless you have written approval from Brian Appell from Avalanche Mountain apps (basically you are buying the source code to use yourself, enough said). * You may modify the source code as you wish (this is good to know down the track if you decide you want to go crazy and add new features, etc). * Very Important – When purchasing a license or multiple license, you do NOT own the source code. 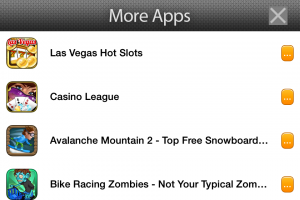 Brian Appell form Avalanche Mountain apps is licensing it to you for reskin purposes only. He and his company remain the owner of the source code (licensing is standard with most software). Is It Time For Android Reskins? Where Do You Buy Source Code For Reskins? Previous Post Avalanche Mountain 2 – Source Code Next Post Avalanche Mountain Part 1, Part 2 And Lotto Scratchers Unlimited License Discount Deal!